New Design, Pretty, Unique, Easy to maintain and not ponding on the two sides with carrara white marble vanity top. It's perfect choice for hospitality project from Newstar Stone. The simple lines of the one piece vanity create a striking silhouette, a white marble vanity top completes the look of the modern bathroom vanity. Crafted of natural marble, the vanity top contain swirling and veining that give it a unique appearance. 2: Natural marble one piece top with beautiful, natural vaining or swirling. 3: Vanity full assembled and ready to easily install. This type of Marble Vanity Sink With Steel Base is very popular in hotel market. It received praise from many clients at the coverings 2018, in Atlanta, Georgia, USA. You can see the article Continuously update the Newstar Stone Team in Coverings 2018. 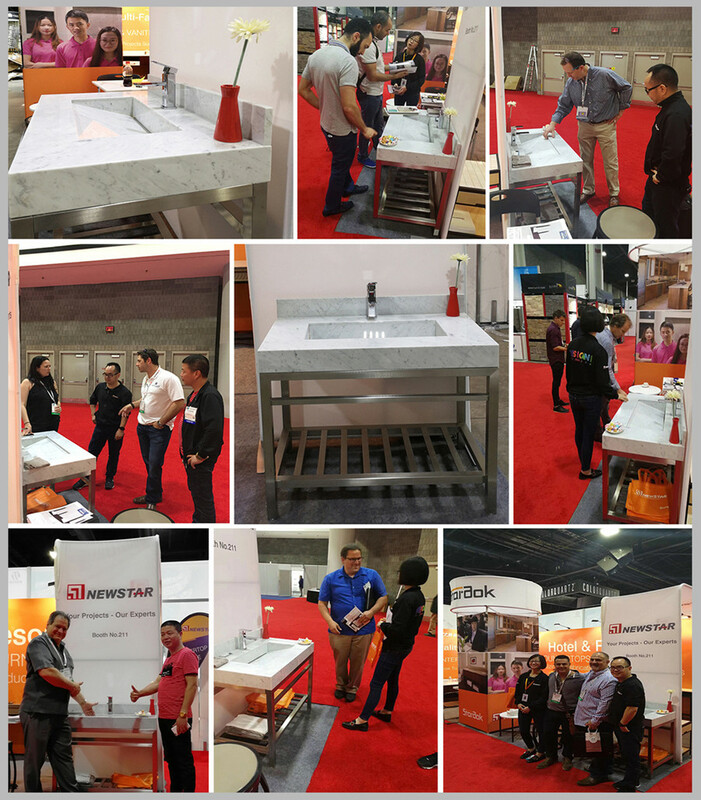 Newstar Stone has more 16 years experience for hospitality industry, one stop shop supply for hospitality products, countertops, bases, sink, faucets, tub surround, accessories, to match every style and budget. We have worked with global projects with most recognized brands, such as Marriott, Hilton, Best Western etc. Find Newstar Stone to help your projects. All materials and size can be customized.